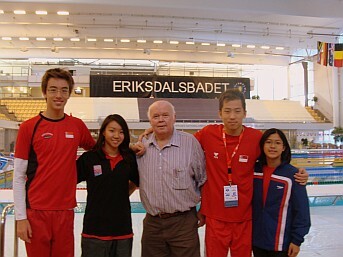 Bill with the Singapore Team at the FINA 2010 World Cup, held in Stockholm, Sweden. Pictured LEFT to RIGHT - Lukas Ming MenKhoff, Cheryl Lim, Bill Sweetenham, Kenneth Lim and Megan Lim. 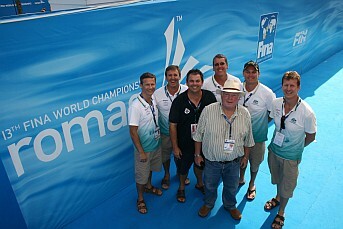 Bill with several staff members of the Australian team at the 2009 Rome World Championships. Pictured LEFT to RIGHT - Craig Boetcher, Michael Bohl, Michael Piper, Matthew Brown, Bill Sweetenham, Rohan Taylor and David Wilson. Britain won two gold medals (women's 400m and 800m freestyle - Rebecca Adlington) and one bronze medal (women's 400m freestyle - Jo Jackson). This is arguably its best ever Olympic results. The 400m win was Britain's first women's Olympic gold medal in 48 years. Bill has been afforded significant credit for this outstanding achievement. During the second half of 2008, Bill is working on pool deck with the Kings organisation. He is also planning to upgrade his series of 9 technique-focused DVDs which have been very popular and sold world-wide through the Australian Swim Coaches and Teachers Association. During July and August of 2008 Bill worked in Singapore with Singapore Swimming and the Singapore Sports Council. Thirteen national swim teams, including the USA and Canada, were conducting their final staging camps prior to the Beijing Olympic Games. In all, 31 national teams in numerous sports held their final pre-Games training in Singapore and close observation was made of many of these teams. Bill is a published author of "World Championship Swim Training" and is currently working on his second book titled "Invincible - Friendly on the Surface, Deadly Below". This book will translate Bill's sporting success stories into life lessons and explain how these lessons can be adapted and incorporated into everyday life and business. Bill has recently completed a series of CDs entitled “International Leadership” which cover all areas on this topic associated with the business and corporate sector, along with sport and the arts. These have been developed by Mr Lee Woodward of the Real Estate Academy of Australia and copies of the CDs are now available and can be obtained through him. 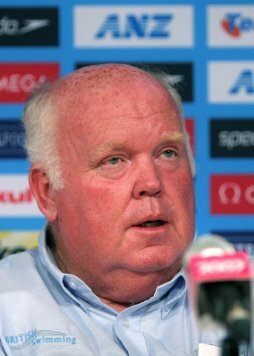 "I refer to the time when Bill Sweetenham joined British Swimming as the National Performance Director. The first thing that struck me was the level of involvement he had with grass roots coaches. A ‘shock wave’ ran through the Amateur Swimming Association’s coaching staff when he demanded a more professional team based approach. He gave unity of direction, a sense of purpose, a compelling vision of the future, and became personally involved in coach and swimmer education. This culminated in the rejuvenation of our sport and some serious debate within the education fraternity regarding their coach development processes. Leadership was about, it was tangible, visible and despite a few reluctant followers, British Swimming emerged as a major player on the international scene. Following London 2012 and four years since Bill Sweetenham left British Swimming, serious questions are now being asked about when went wrong in the aquatics disciplines. Eyes have turned towards the rejuvenation of British Cycling led by David Brailsford, and this has prompted a search for effective leadership within swimming."